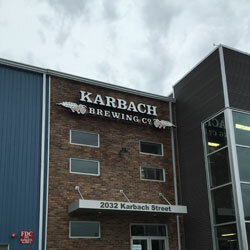 Karbach Brewing Company is located just blocks off 290 a couple of miles north of the 610 loop. 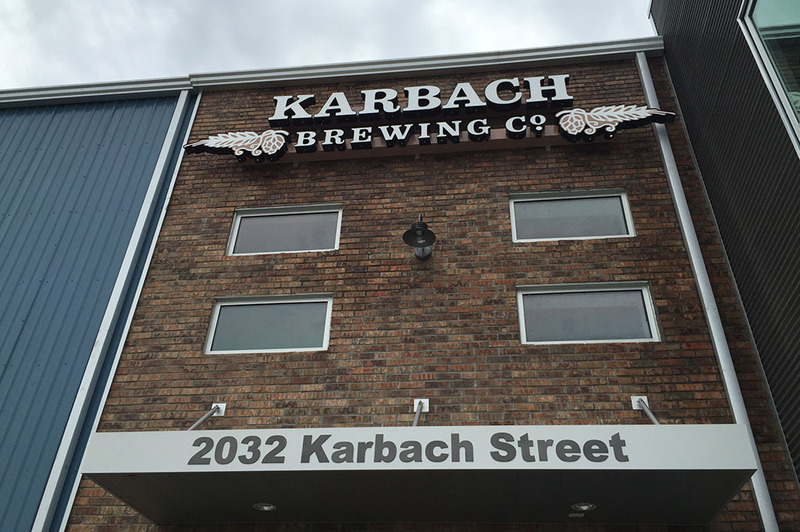 While there are many new craft breweries popping up around town, Karbach Brewing Company is the benchmark for Houston brewing, for sure. There are big things going on here. 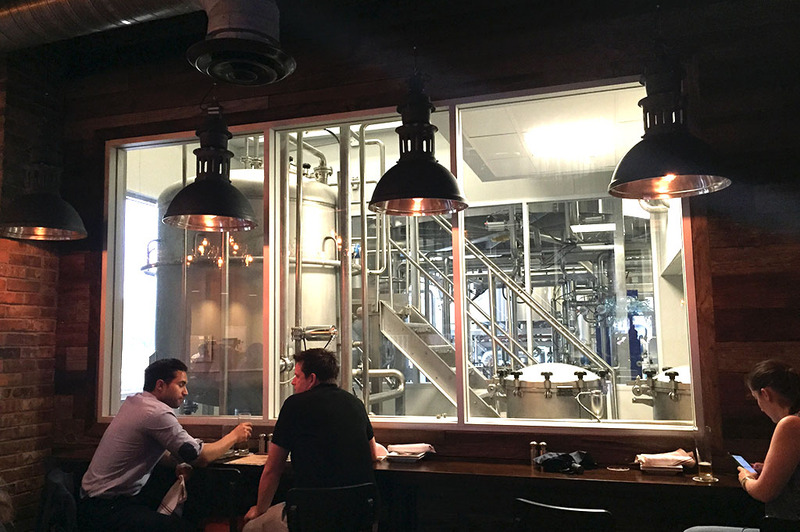 When you walk into the new restaurant, the first thing you notice is that everything you see screams craft beer, from the glass windows that provide a glimpse into the brewing process to the beer bottle light fixtures. 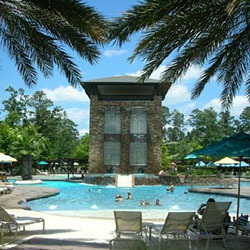 This place is cool. 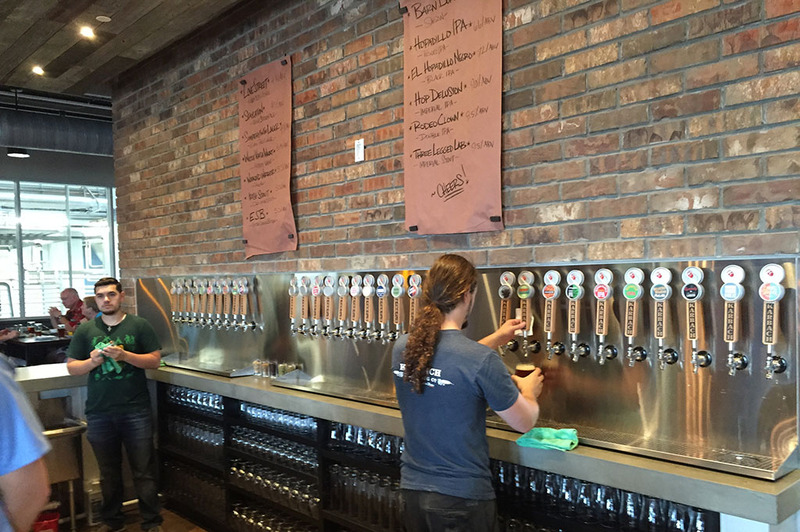 Founders Ken and Chuck got their start in beer distribution. 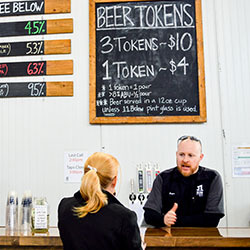 When they decided to go all in and start their own brewery, they left that world behind. And, I can tell you, I’m so glad they did! 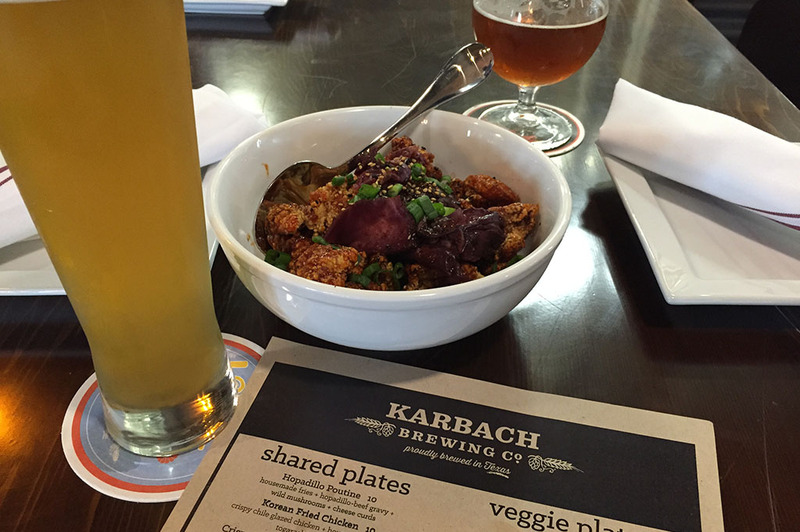 Karbach has a wide variety of very tasty beers, and now they are serving food as well. They’ve opened a wonderful new restaurant with a spacious patio for comfortable outdoor seating. We stepped up to the plate and ordered a couple of Hoppadillo’s (my favorite local IPA). We decided to give the food a try, expecting the usual bar food fare. Boy, were we mistaken! The head chef used to work at a local fine dining restaurant, something that would soon be obvious from our meal. We asked our server (who was quite well-educated and personable) what his suggestions were. 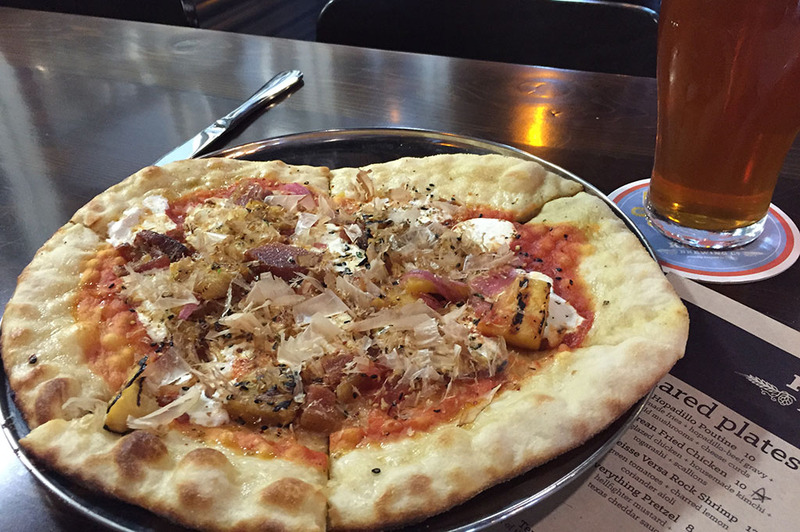 He told us what the fan favorites were and we went with that: the Korean Fried Chicken and the Pineapple Express Pizza. 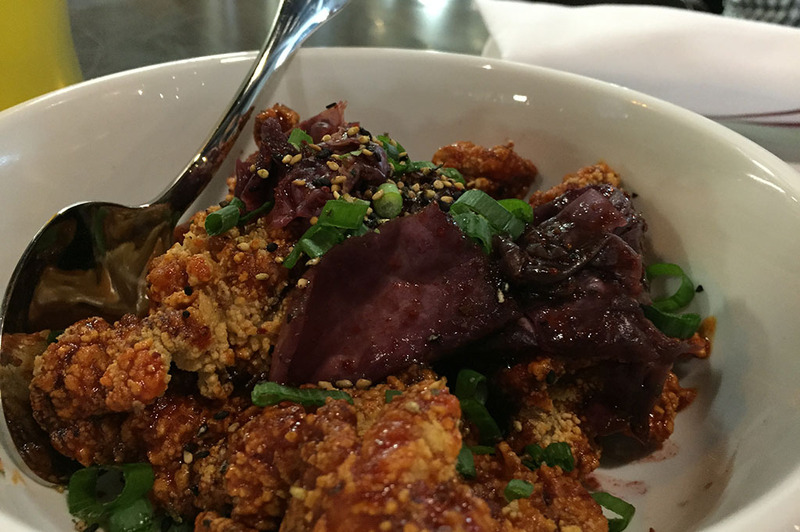 The Korean Fried Chicken consisted of crispy, chile-glazed chicken, housemade kimichi, togarashi, and scallions. This dish was incredible! 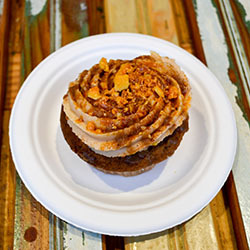 The sweet and spicy flavors blended well with the Hoppadillo. I suggest you get this combo as the pairing is something special and it’s a prime example of what Karbach is all about; good beer and good times! 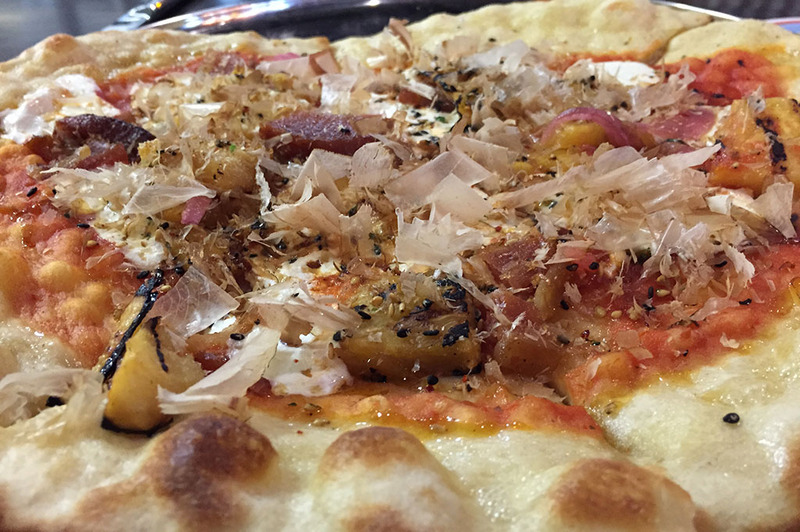 The Pineapple Express Pizza was an experience all in itself: a delightful combination of smoked pork belly, charred pineapple, mozzarella, onion, togarashi and shaved bonito. This pizza danced! The shaved bonito seems to come alive when heated up; you’d swear it was flapping about as it arrived at the table. The pork belly was divine and the presentation was done with care. All in all, it was an excellent choice. 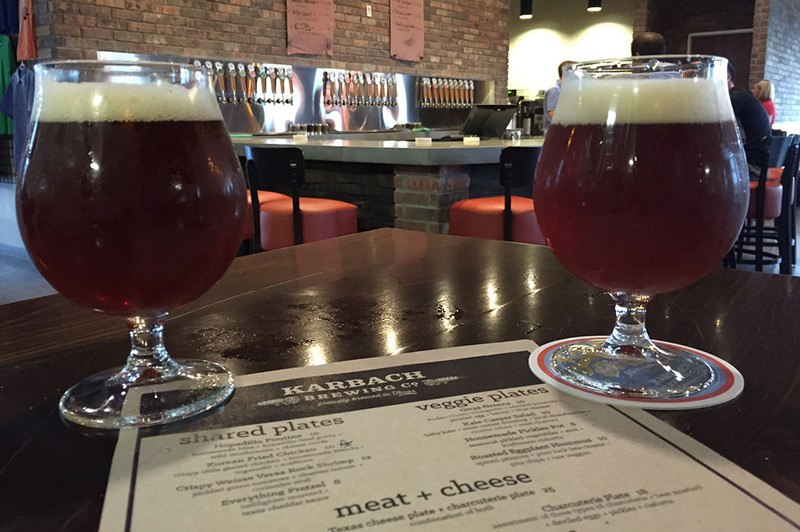 Karbach Brewing Company has a number of different-style pizzas. I recommend you find a flavor that suits you and go with it. 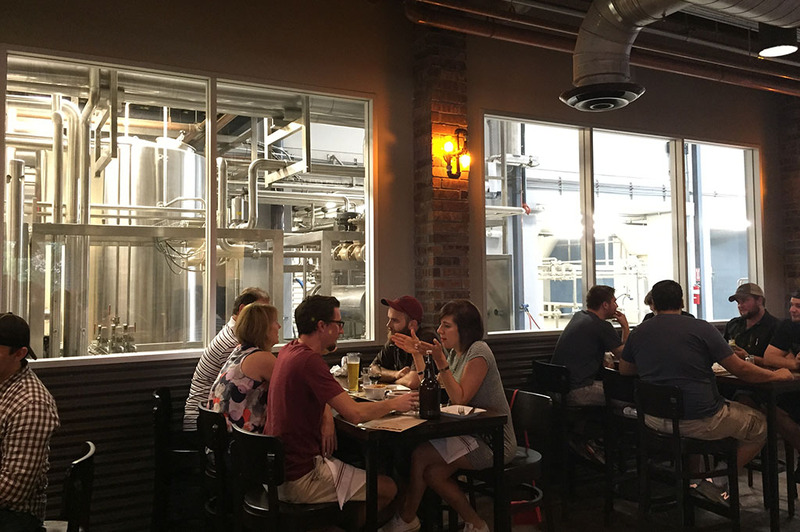 Make sure you ask your server which beer to pair it with as each entree is designed with one of their specialty craft beers in mind. 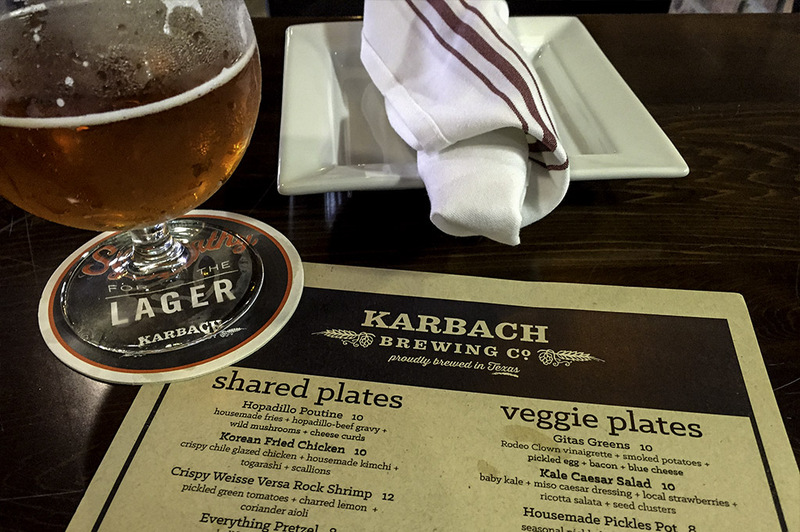 The Karbach brewing experience leaves nothing on the table. 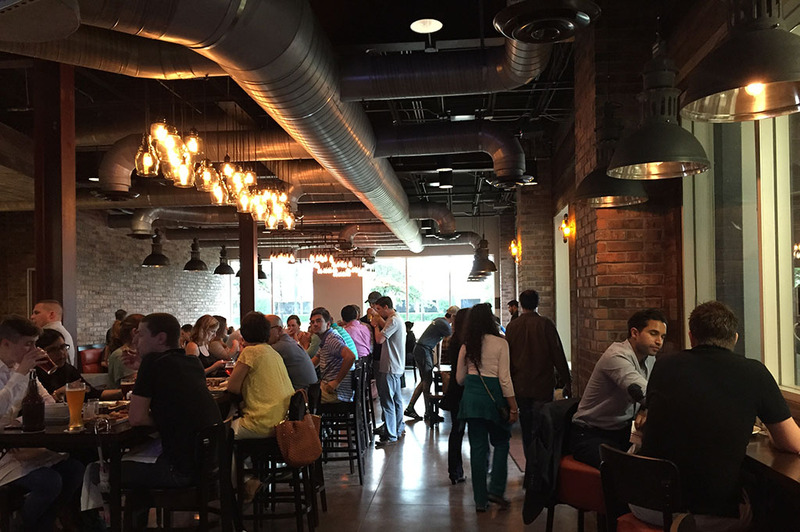 They have everything from great craft beer to delicious cuisine. 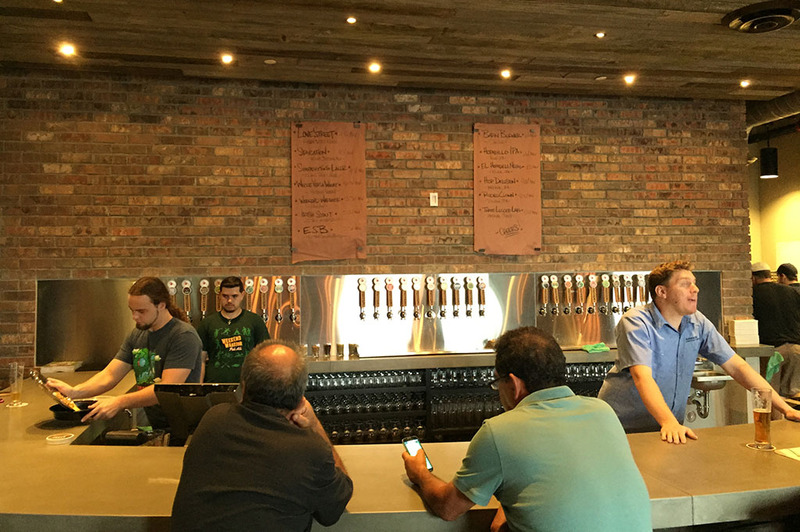 You can even take a full tour of the facilities to see exactly how they brew their quality craft beer. 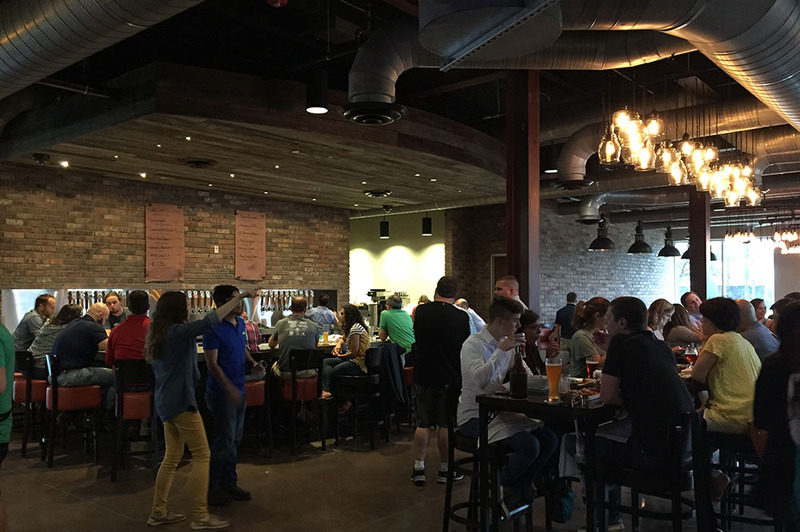 It’s more than just a tasting room; it’s a craft beer experience. I suggest you find a few friends and stay a while as it’s not every day you get to enjoy yourself like this. 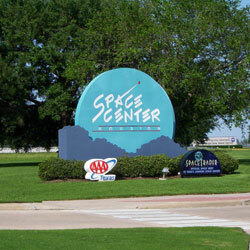 Well, unless you work here… are there any openings?